This photo is of a group of men in Uruguay. 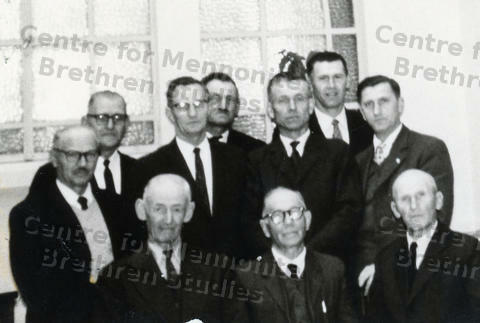 The men in the middle row from left to right are: Joe P. Neufeld, Winnipeg pastor ; Jacob Franz, long term missionary in Paraguay; ? Foth, M. B pastor in rural Uruguay; American MB mission administrator A.E. Janzen sits in the middle front. All the men are dressed in suits, white shirts, and ties.